Another Monday, another sketch from MJ at TechnoStamper. I have to tell you, I've looked at this sketch a few times now, and it just wasn't coming together. My muse is way off here (I think it's still on vacation) - but I can tell you I've found it in the next post I'll be sharing....until then here's a look at what I created for MJ's sketch #52. 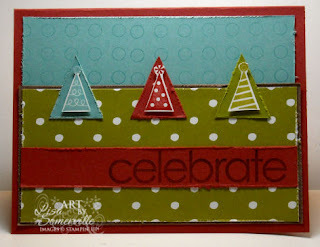 To get the polka dots on my Baja Breeze card stock I used the calendar circles from Mark the Date - in a pinch they make a great background. The hats are a perfect choice, I am not sure what I was thinking with the triangles but the layout is cool. Love the colors you used, thanks for playing you did a great job. Your Card brought a smile to my face. I really like it! I LOVE this with the party hats!! What a creative and fabulous idea. Great job....as always!